14. Avoid strict commands and making important decisions during eclipses. Okay, let’s speak examples. Imagine yourself getting a new cool apartment and the only day you for you to move in is the day of the full moon eclipse. It wasn’t you who set the date, it was just stated as comfortable time in the contract. In this case, it is okay to sign it and move in, as it wasn’t you who decided, you simply react. And here is another example to show you the other side. You want to speak to your partner as there are a lot of issues that piled up for the last period of time. As you make a decision here, it is better for you to shift this talk to the day after the eclipse ends. Your communication will be concise and not spoiled by the emotional tension of an eclipse. However, as you may have noticed, eclipses are quite straightforward on emotional things to happen, so maybe you will not need to speak to your partner, the conversation will arise whether you have decided to wait or not, if this thing was meant to happen. In the first example you see that you are the one who reacts on the conditions provided by someone or something else. In the next example you are the person who decides to take actions during an eclipse, which is not the best decision. 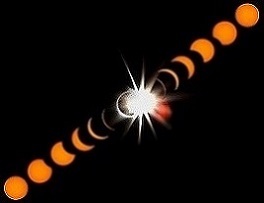 There is a well known fact inside of astrological community: if you wanted to do something during an eclipse, brace yourself, as most of the time the things aren’t going to be the way you want. That is the reason you need to shift the timeframes of taking actions. It is okay to respond, but not to provoke. And a bonus tip: if you are responsible for hiring people in the place of your work, avoid hiring people during an eclipse. The optimal way is to wait about ten days to find professionals for your team. Also, it is needed to say that if you have to act during an eclipse, it is always better to do so during the solar new moon one. Such eclipse usually favors beginnings and fresh possibilities. Check your natal chart and the relation of the eclipse with planets there. 15. If you have a birthday during an eclipse, this year will be substantial for you. It can be the year of an absolute change in many areas of your life. It can be really massive with its influence on you. If an eclipse coincides with your ascendant or the 1 st house in your natal chart, it is also a sign of something major to change in your life. The past will step aside for new things to come.